Smok took their TFV line and turned it on its head with the crafting and release of the TFV8 aptly name the Cloud Beast. Due to its ability to sustain high temperatures and its abundance of coil options, the Cloud Beast is a huge step toward bridging dripper and tank performance into one. For those who need a tank capable of handling a holding as much liquid as possible without sacrificing cloud and flavor the TFV8 is meant for you. 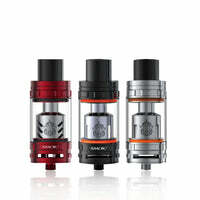 SMOK TFV8 Cloud Beast Sub Ohm Tank has a rating of 4.6 stars based on 30 reviews.